When firefighters arrived at the scene of a house fire in Milton, West Virginia on Saturday, they were shocked to see who beat them to the scene. 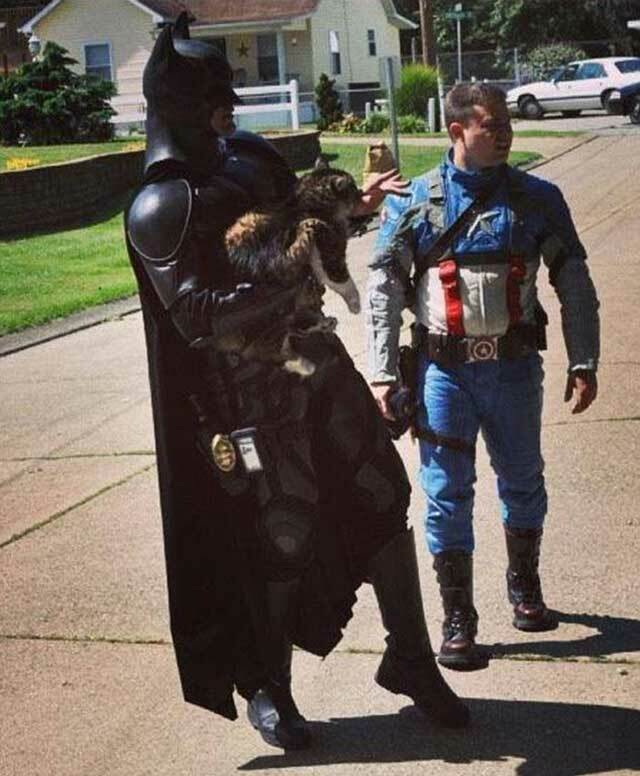 Batman and Captain America, or John Buckland and Troy Marcum were both in costume at an event at the nearby American Legion Post. They were teaching positive lessons to children, but the lesson became real life. When they saw smoke, the two superheroes sprang into action, rushing towards the flames to see if anyone was inside. "I grabbed his shoulders, gave it everything we got and the door opened," Buckland said. Before Buckland started his "Hero 4 Higher" business, He used to be a firefighter, and even did so through the military while stationed in Iraq. Buckland said his training kicked in. "He (Captain America) breaks out the window," Buckland said. "The smoke gets out and as I can start to see I reach down and grab something furry!" 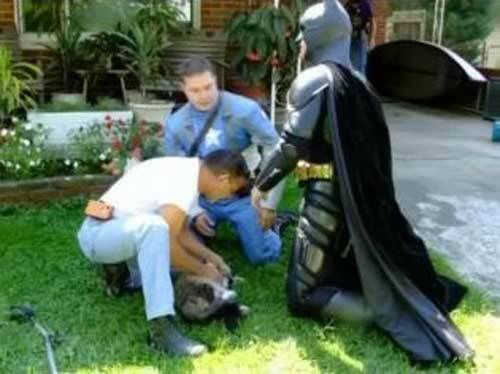 While the home owners were out of town, their cat couldn't get out and had to be resuscitated by Batman. "The cat comes around," Buckland said. "Takes a look at me, then hissed!" While the cat might not have been pleased, it's a different story for the people who watched. Tom Cantaberry was at the Legion Post and saw the dramatic rescue take place. "He did a great job," Cantaberry said. "It was complete chaos!" However, Buckland said don't let the costume fool you, he's no hero. "I just wonder what the cat was thinking," Buckland said. "I'm glad no one was inside." There's an additional news video here. "I grabbed his shoulders, gave it everything we got..."